For the last few months I’ve been going through a massive poached egg phase. I even order them when I’m out for breakfast at my favourite local cafe. If it isn’t asparagus season where you are, try them with a handful of baby spinach (or better yet baby kale) or other sliced raw veg. 1. Bring a small saucepan of water and the vinegar to the boil on a very high heat. 2. Break an egg into a small cup and slide gently into the boiling water. Repeat with the other egg. 3. Reduce the heat to keep the eggs at a gentle simmer and cook for 3 minutes or until the eggs feel firm but not hard. 4. Meanwhile slice asparagus finely on the diagonal and place on a plate. 5. Drain eggs with a slotted spoon and pat dry with a clean tea towel. You could ‘semi’ poach the eggs for two minutes then place in a bowl of iced water. When you’re ready to reheat poach again for another 1-2 minutes. Will keep in the fridge for a few days. But really they’re best when freshly poached. The asparagus will also keep for a while but won’t be as nice as when it is freshly cut. carnivore – serve with crispy bacon or a few slices of finely sliced proscuitto draped over. vegan / egg-free – poach a bunch of asparagus per person until just tender (about 5 minutes) and serve with a big spoonful of vegan mayonnaise. different veg – a handful of baby spinach or baby kale fresh from the garden is my go-to poached egg accompaniment. But fresh veg can be lovely. If it isn’t asparagus season try raw finely sliced zucchini, white cabbage or even snow peas. vinegar – keep it in the pantry. too bland?– Be generous with the seasoning. And make sure you’re using the best eggs. eggs messy – the fresher your eggs are, the firmer the whites and the better they keep together. The vinegar helps keep the protein tight. If your whites are going everywhere, it means your eggs weren’t fresh enough. They’ll still taste delicious though. vinegary flavour or watery – sometimes the egg white can trap quite a bit of water so it’s important to pat the eggs dry with a tea towel or kitchen paper otherwise you end up with watery vinegar on your plate. rubbery eggs – this is a sign you’ve cooked the eggs at too high a temperature. Next time be more vigilant in making sure you’re only using a gentle simmer once you’ve add the eggs. eggs too runny – if your eggs were cold from the fridge, they’ll take longer than 3 minutes to cook. With practice you’ll be able to tell from touching the egg when they are firm enough. For a firm yolk, you’ll need to allow up to 5 minutes of poaching. Great as breakfast on it’s own. Hi Jules – I was just wondering why you use vinegar and why you use so much? Is it just a flavour thing? I too love poached eggs from my own chooks but never use vinegar as I thought you only needed to do that with stale store-bought eggs to keep the whites from spreading every where! It’s to help the protein set quickly and avoid the whites spreading. Chris Ann.. Fresh eggs often don’t need it but old habits die hard! The TV show ‘how to cook like Heston’ had a segment on perfect poached eggs. No vinegar, no whirlpools, no sticking. 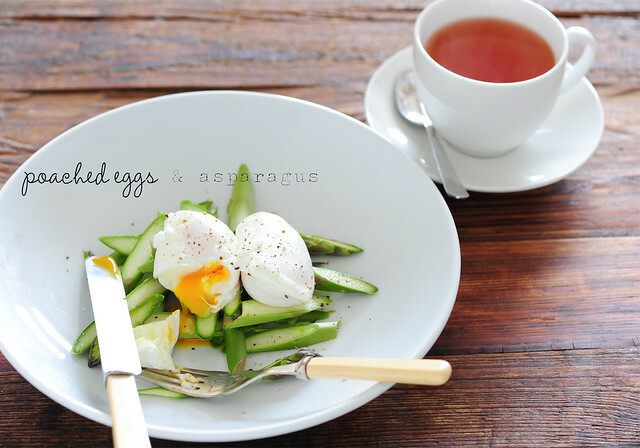 I used to only have poached eggs when I went out, but now I can do it at home with no stress. Youtube has the video. As you are a bit of a scientist (like heston?) when it comes to food Jules, I would love to hear what you think after you try it. I LOVE Heston… and I’ve seen the poached egg episode… I haven’t tried it because it seems such as waste to get rid of all the excess whites just to have better looking eggs. But if it’s working for you keep at it! Every time I try to poach eggs, they stick to the bottom of the pan, no matter how high the boil or how deep the water. It’s so bad that I usually prefer to coddle them rather than scrape them off the bottom of the pan and cause the whole thing to explode. Any ideas why this is happening? They just sink straight down and stay there, even if I let it come up to a rolling boil before I add in each egg. Now you mention it, I have had the odd egg stick to the bottom but I haven’t really thought about it.. I kinda assumed it was because I didn’t have the water hot enough. I’d love to help you get to the bottom of this. Does it happen when you use vinegar in the water? It happens to me with or without vinegar. Maybe I need to put more vinegar in? I’ve also read the thing about draining off the runny white part, but I can never be bothered. I’m with you in that it seems like a waste of quite a lot of egg. Glad you liked them Annie!